Smithsonian researchers report that the brains of tiny spiders are so large that they fill their body cavities and overflow into their legs. As part of ongoing research to understand how miniaturization affects brain size and behavior, researchers measured the central nervous systems of nine species of spiders, from rainforest giants to spiders smaller than the head of a pin. As the spiders get smaller, their brains get proportionally bigger, filling up more and more of their body cavities. Some of the tiniest, immature spiderlings even have deformed, bulging bodies. The bulge contains excess brain. Adults of the same species do not bulge. Brain cells can only be so small because most cells have a nucleus that contains all of the spider’s genes, and that takes up space. The diameter of the nerve fibers or axons also cannot be made smaller because if they are too thin, the flow of ions that carry nerve signals is disrupted, and the signals are not transferred properly. One option is to devote more space to the nervous system. Brain cells use a lot of energy, so these small spiders also probably convert much of the food they consume into brain power. The enormous biodiversity of spiders in Panama and Costa Rica made it possible for researchers to measure brain extension in spiders with a huge range of body sizes. 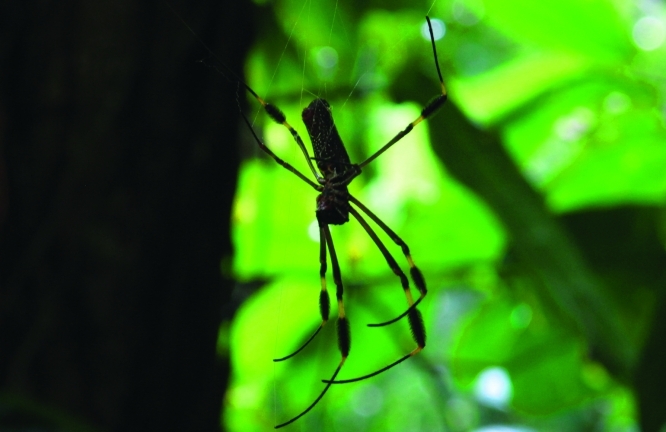 Nephila clavipes, a rainforest giant weighs 400,000 times more than the smallest spiders in the study, nymphs of spiders in the genus Mysmena. From STRI – Smithsonian Tropical Reserach Institute web. The earth is not a solid or static mass. It is composed of segments — tectonic plates— that cover a shifting mantle. These plates have different movements. They crash into each other and separate, they slide and sink and emerge, forming mountain ranges such as the Andes and Rocky Mountains, oceans, major earthquakes and volcanoes, and bridges like the one that joins North and South America. Before a large audience that far surpassed the capacity of the Tupper Center Auditorium of the Smithsonian in Panama, STRI geologist Anthony G. Coates explained how, twenty million years ago, the Isthmus of Panama began to emerge through the clashing and sliding of tectonic plates. Before this, Central America as we know it today was part of a volcanic peninsula, far from its current location. With the emergence of the Isthmus of Panama, the planet experienced changes resulting in the current world order. 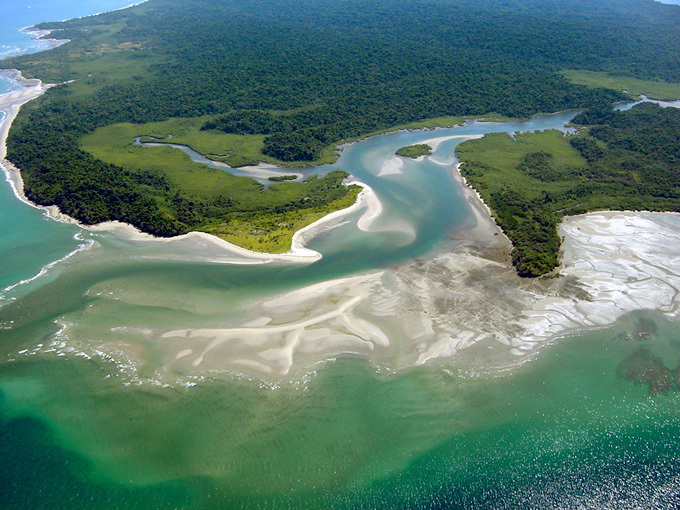 For three million years, Panama has separated the oceans and joined two continents. It promoted the exchange of species between the Americas, enabling Amazonian fauna to colonize areas as far north as Mexico and creating the abundant tropical biodiversity we have today. It is responsible for the extensive development of coral reefs, initiated a new global ocean circulation pattern, contributed to the glaciation of the northern hemisphere, and changed the climate of the tropics. Because of the Isthmus, the winds that cross the Gulf Stream are warmed and Europe is spared from freezing over in the winter. It is even possible that the ancestors of the human race came down out of the trees because of climate change in Africa which was also a product of the emergence of the Isthmus. 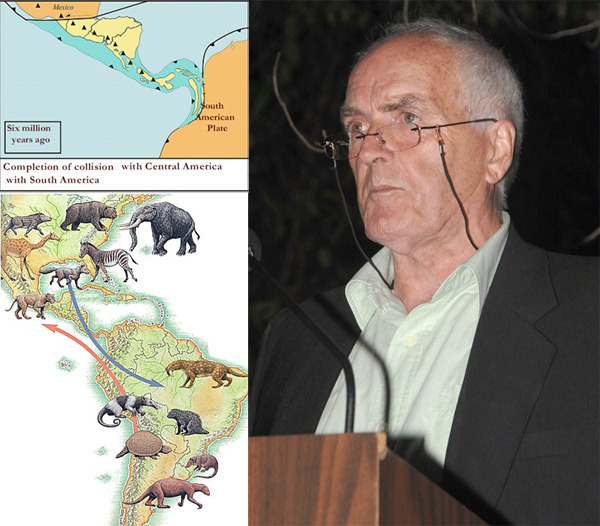 Using videos, geological maps of the earth’s plates, sections of fossil sequences and rock-dating techniques, Coates amazed the public and students present with his description of how Panama’s geological past was reconstructed, as part of the celebrations commemorating a Century of Smithsonian Science in Panama, on Wednesday, April 27. The next Centennial talk, by Hermógenes Fernández-Marín, will be be held on May 25.